We read the first two books in the Goldtown Adventures series a while back, and wow, did I ever enjoy them. Susan K. Marlow does a great job with adventurous fiction, set roughly in Gold Rush days in California. This series is actually set in the 1860s, just past the Gold Rush days, and the main character is Jem, a young boy who is just a delight. I had the chance to review books 3 and 4 in this series. 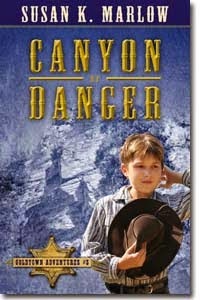 Canyon of Danger has Jem as the man of the family while his father is away. He thinks that is going to be a grand adventure, and he does take his role seriously. But a wolf getting one of the calves is just the start of one serious mishap after another. Most of the time, Jem is making reasonable decisions -- but trouble comes along regardless. I'd try to summarize the plot, but I think that would make it sound like a bad country song. It is one thing after another, after another. Jem learns a thing or two along the way, as does the reader. We're introduced to a former Pony Express rider, so a bit of history and explanation of how that worked is woven into the narrative. What was really great is that there are free Enrichment Guides available, and I would highly recommend these. The guides do have some "schoolish" activities that could be great if you are using this in a homeschool setting. But for Book 3, it also gives more information about topics such as the Henry Rifle, medicine of the 1860s, animal tracks, the Pony Express, and Life Zones in the Sierra Nevadas. Those sections are great for anyone just reading the book -- or it can be used to do more of a unit study. 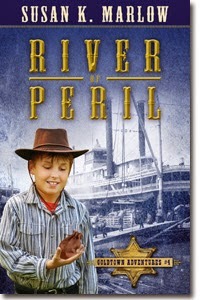 Book #4 is River of Peril. This finds Jem and his family heading to San Francisco, only their little vacation turns into a string of adventures. Of course. This time, readers learn more about the Civil War and how that impacted people way out in California. The Enrichment Guide again gives some fantastic additional information, mostly transportation related -- stagecoaches, steamboats, and paddleboats. Both of these books quickly get you into the action, so you are pulling for Jem (and his family) to get out of whatever scrape they are in right away. These books are intended for ages 8-12, and I do think that is a good range for them. These are books that I think are perfect for a little reluctant-reader boy. Grab a book, start reading out loud. Get a chapter or two into it, and determine that you need a rest. Then leave the book out, with a bookmark, and don't have time to get back to it. Disclaimer: I received these books through Kregel Blog Tours. No other compensation was received. All opinions expressed in this review are my own.